As a family, we were raised to appreciate the sacrifices of the brave men and women who have dedicated their lives to the service of others. 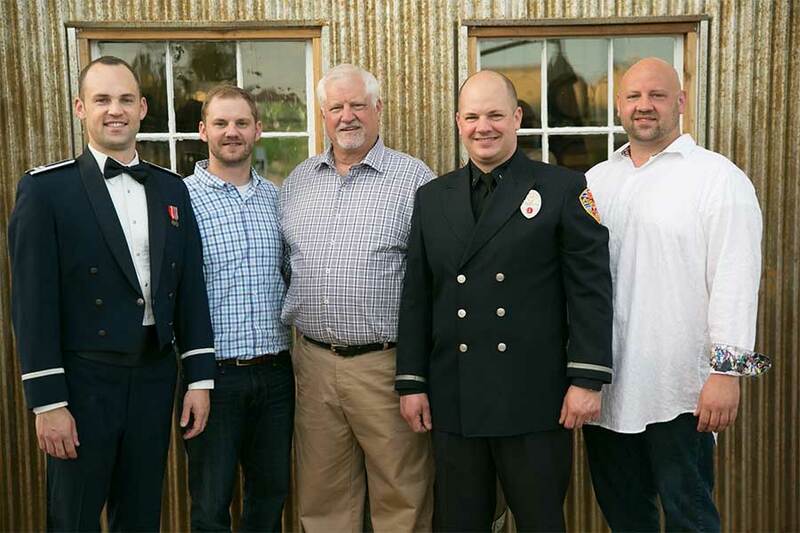 With a firefighter and an Air Force pilot among the brothers, we understand firsthand the risks our public servants take each and every day, the hardships endured by our loved ones, and the joy that comes from a life of service. As we entered our third vintage, we wanted to show our support for those heroes that have paid the ultimate price for their dedication to others and those survivors they have left behind. We have partnered with the National Fallen Firefighters Foundation to raise both awareness and funds for their very important mission. Distant Cellars is happy to announce that we raised nearly $95,000 for the NFFF since our first release of the 2010 Tribute Red Blend! Now in its fifth vintage, we're offering you our 2014 Tribute Red Blend with another amazing label from Christopher Owen Nelson. We hope you enjoy this fine red blend and we appreciate your continued support of the National Fallen Firefighters Foundation! Distant Cellars will donate 30% of all sales of our Tribute wine to the NFFF. The United States Congress created the National Fallen Firefighters Foundation to lead a nationwide effort to remember America's fallen firefighters. Since 1992, the tax-exempt, nonprofit Foundation has developed and expanded programs to honor our fallen fire heroes and assist their families and coworkers. The Foundation is a 501(c)3 nonprofit organization, located in Emmitsburg, Maryland. It is registered as a corporation in the State of Maryland. The Foundation receives funding through private donations from caring individuals, organizations, corporations, and foundations. A grant from the Department of Justice's Bureau of Justice Assistance supports programs for survivors of fallen firefighters. The Federal Emergency Management Agency partners with the Foundation to sponsor many of the National Memorial Weekend activities. The National Institute of Standards and Technology supports work on a national research agenda to prevent line-of-duty deaths.